Today on Historically Thinking, Al Zambone interviews Lorri Glover on her book The Founders as Fathers. It’s a holiday twofer mashup: a sort of July 4th Founding Father theme, wound around a jumble of Father’s Day parental anxieties. In the course of the interview, the two historians mull over a set of related questions. How did a man who was almost certainly infertile became so quickly identified as his country’s Father? Why did every founder–with the exception of Washington himself–go back home as often as they could? 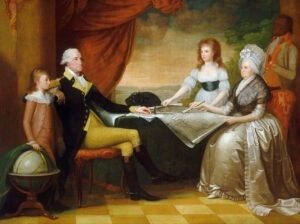 Were their families more important to the founders than the new country? Was there a parenting crisis brought about by the American Revolution? And was Jackie Custis the worst stepson in the world, or what?